The figures are looking good. It would be nice to have a larger picture to zoom in on. 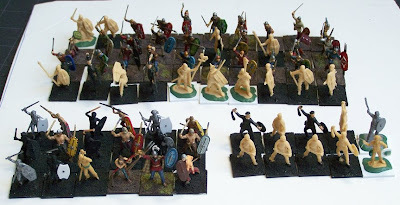 I've had some good use out of my 1/72 ancient Britons which like yours are a mixture of Airfix, Italeri, HaT and Revell. I scratch built my own wheels for the Airfix chariots. I've just bought a box of HaT chariots which I will paint be painting up next. They seem very narrow compared to the Airfix ones. I've read that British chariots were narrow, so narrow that the passenger most certainly had to stand behind the driver (not side by side). I wanted to buy that same HAT set, but I wasted all my birthday money on books!